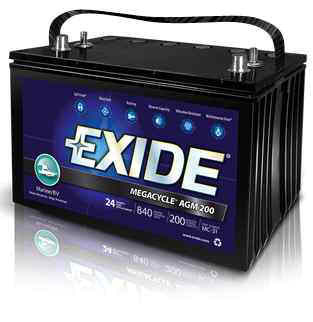 Exide knows the importance of worry-free time on the water and has your answer – MegaCycle AGM 200. The MegaCycle AGM-200 withstands the pounding waves and holds a charge longer for a fuller life, which means yours will be too. Non-spillable – allows orientation on battery side (inverted not recommended). Active material support by AGM separators allows for improved cyclability over flooded product – At least 2X greater cycling ability at moderate depth of discharge levels (SAE j2185) and 3.4X greater cycling ability at deep discharge levels. With up to 1110 MCA, this battery has the right starting power when you need it. Provides deep cycle and starting power for high energy requirements in larger marine vessels, recreational vehicles and for other specialty applications including low-riders, mobility equipment and sump pumps. Rigid element compression by AGM separators allows for over 14X the vibration protection of a heavy duty, anchor-bonded product, and over 14X the vibration protection compared to a standard product. Rigid polypropylene case/cover protects against wave pounding vibration for longer life. Sealed maintenance-free design with no free flowing electrolytes. Low self discharge rates allow for 30% greater shelf life than flooded types. Stainless steel threaded And SAE Posts provide ease of installation and permit uncluttered wiring harness for electrical connections.